A few years back, I was in seminary and pursuing ordination in the PCA. American Presbyterianism has a fractured history, and I wanted to get it sorted out in my head. I started mapping them out in a notebook… and eventually I decided to turn my scribbles into an infographic. It’s a weave of overlapping timelines that charts the many splits and unions that have happened over the past 300+ years. Check it out below. You can find links to downloadable / printable versions below! This timeline is most heavily dependent on the Presbyterian Historical Society, especially the work of David Staniunas. 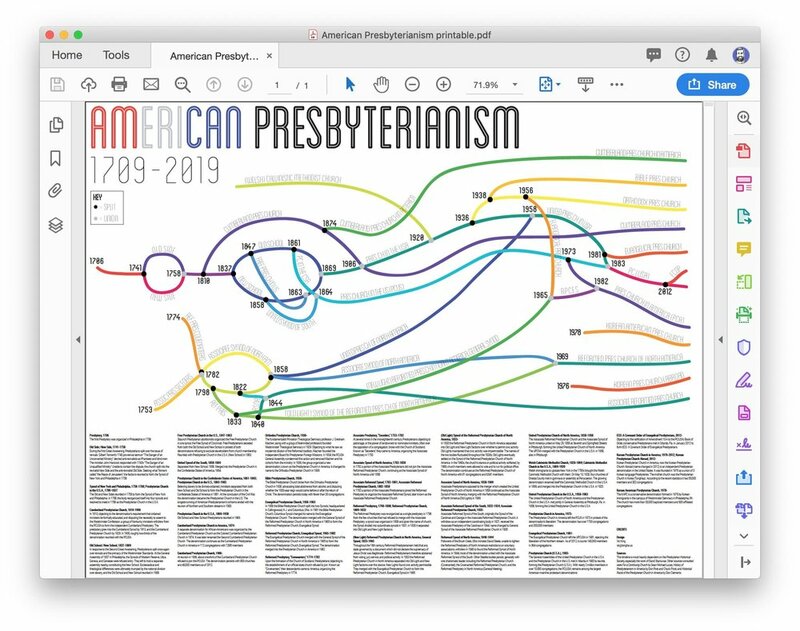 Other significant sources were For a Continuing Church by Sean Michael Lucas, History of Presbyterianism in America by Don Post and Chuck Frost, and Historical Roots of the Presbyterian Church in America by Don Clements. And if you want to read about how Presbyterians - and other branches of the American church - have been involved in slavery and racism, check out The Color of Compromise: The Truth about the American Church’s Complicity in Racism by Jemar Tisby. Attribution — You must give appropriate credit, provide a link to the license, and indicate if changes were made. You may do so in any reasonable manner, but not in any way that suggests the I endorse you or your use. Does your church (or presbytery) need a website? If you’re here, you might be part of a Presbyterian church. These days, the internet is your church’s front door… and you want it to be as friendly, clear, and welcoming as you are. I can help with that. It just so happens that I designed the website for the Chesapeake Presbytery of the PCA. If I can be of service to you, your church, or your network, let’s talk! Below is the complete text across the bottom of the infographic. The first Presbytery was organized in Philadelphia in 1706. During the first Great Awakening, Presbyterians split over the issue of revivals. Gilbert Tennent's 1740 pro-revival sermon "The Danger of an Unconverted Ministry" decried anti-revivalists as Pharisees and blind men. The minister John Hancock responded with 1743's "The Danger of an Unqualified Ministry." Unable to contain the dispute, the church split into the revivalist New Side and the anti-revivalist Old Side. Seeking what Tennent called "the Peace of Jerusalem," the factions reunited to form the Synod of New York and Philadelphia in 1758. The Old and New Sides reunited in 1758 to form the Synod of New York and Philadelphia. In 1788, the body reorganized itself into four synods and resolved to meet in 1789 as the Presbyterian Church in the U.S.A. In 1810, objecting to the denomination's requirement that ordained ministers be formally educated, and disputing the necessity to assent to the Westminster Confession, a group of Kentucky ministers withdrew from the PCUSA to form the independent Cumberland Presbytery. The presbytery grew into the Cumberland Synod by 1813, and the Cumberland Presbyterian Church by 1829. In 1906, roughly two-thirds of the denomination reunited with the PCUSA. In response to the Second Great Awakening, Presbyterians split once again over revivals and the primacy of the Westminster Standards. At the General Assembly of 1837 in Philadelphia, the Synods of Western Reserve, Utica, Geneva, and Genesee were refused entry. They left to hold a separate assembly nearby, constituting the New School. Ecclesiastical and theological differences were ultimately trumped by the national division over slavery, and the Old School and New School reunited in 1869. Staunch Presbyterian abolitionists organized the Free Presbyterian Church in one synod, the Free Synod of Cincinnati. Free Presbyterians seceded from both the Old School and New School in protest of both denominations refusing to exclude slaveholders from church membership. Reunited with Presbyterian Church in the U.S.A. (New School) in 1863. Separated from New School, 1858. Merged into the Presbyterian Church in the Confederate States of America, 1864. Believing slavery to be divinely-ordained, ministers separated from both New School and Old School to form the Presbyterian Church in the Confederate States of America in 1861. At the conclusion of the Civil War, the denomination became the Presbyterian Church in the U.S. The longest-running of American Presbyterianism's schisms ended with the reunion of Northern and Southern streams in 1983. Old School and New School Presbyterians reunited in 1869. A separate denomination for African-Americans was organized by the Cumberland Presbyterian Church as the Colored Cumberland Presbyterian Church in 1874. It was later renamed the Second Cumberland Presbyterian Church. The denomination continues as the Cumberland Presbyterian Church in America in 112 congregations with 7,885 members. At reunion in 1906, about one-third of the Cumberland Presbyterian Church refused to join the PCUSA. The denomination persists with 900 churches and 46,000 members as of 2012. The fundamentalist Princeton Theological Seminary professor J. Gresham Machen, along with a group of likeminded professors founded Westminster Theological Seminary in 1929. Objecting to what he saw as modernist dilution of the Reformed tradition, Machen founded the Independent Board for Presbyterian Foreign Missions. In 1934, the PCUSA General Assembly condemned this action and removed Machen and his cohorts from the ministry. In 1936, the group organized a new denomination, known as the Presbyterian Church in America; it changed its name to the Orthodox Presbyterian Church in 1939. The Bible Presbyterian Church broke from the Orthodox Presbyterian Church in 1938, advocating total abstinence from alcohol, and disputing whether the 1000-year reign would come before or after the return of Christ. The denomination persists today with fewer than 30 congregations. In 1956 the Bible Presbyterian Church split into two Synods, headquartered in Collingswood, N.J. and Columbus, Ohio. In 1961 the Bible Presbyterian Church, Columbus Synod changed its name to the Evangelical Presbyterian Church. The denomination merged with the General Synod of the Reformed Presbyterian Church in North America in 1965 to form the Reformed Presbyterian Church, Evangelical Synod. The Evangelical Presbyterian Church merged with the General Synod of the Reformed Presbyterian Church in North America in 1965 to form the Reformed Presbyterian Church, Evangelical Synod. The denomination merged into the Presbyterian Church in America in 1982. Upon the formation of the Church of Scotland, Presbyterians objecting to the establishment of an official state church refused to join. Known as "Covenanters," their descendants came to America, organizing the Reformed Presbytery in 1774. At several times in the mid-eighteenth century, Presbyterians objecting to patronage, or the power of landowners to nominate ministers, often over the opposition of a congregation, broke with the Church of Scotland. Known as "Seceders," they came to America, organizing the Associate Presbytery in 1753. In 1782 a portion of the Associate Presbyterians did not join the Associate Reformed Presbyterian Church, continuing as the Associate Synod of North America until 1858. The Reformed Presbytery was re-organized as a single presbytery in 1798 from the few churches that had refused to merge with the Associate Presbytery; a synod was organized in 1809 and given the name of church; the Synod divided into subordinate synods in 1831; in 1833 it separated into Old Light and New Light factions. Throughout the 18th century, Reformed Presbyterianism held that any state governed by a document which did not declare the supremacy of Jesus Christ was illegitimate. Reformed Presbyterians therefore abstained from voting, jury service, and political activity. In 1833 the Reformed Presbyterian Church in North America separated into Old Light and New Light factions over this stance. New Lights found civic activity permissible. They merged with the Evangelical Presbyterian Church to form the Reformed Presbyterian Church, Evangelical Synod in 1965. In 1833 the Reformed Presbyterian Church in North America separated into Old Light and New Light factions over whether to permit civic activity. Old Lights maintained that civic activity was impermissible. The names of the two bodies fluctuated throughout the 1830s; Old Lights eventually settled on the Synod of the Reformed Presbyterian Church of North America. In the 1960s, the church's stance on political activity softened; by 1969, church members were allowed to vote and to run for political office. The denomination continues as the Reformed Presbyterian Church of North America with 81 congregations and 6,641 members. Associate Presbyterians opposed to the merger which created the United Presbyterian Church of North America in 1858 continued as the Associate Synod of North America, merging with the Reformed Presbyterian Church of North America (Old Lights) in 1969. Associate Reformed Synod of the South; originally the Synod of the Carolinas and Georgia in the Associate Reformed Presbyterian Church, it withdrew as an independent coordinating body in 1821; received the Associate Presbytery of the Carolinas in 1844; name changed to General Synod of the Associate Reformed Presbyterian Church in 1935. Followers of the Brush Creek, Ohio minister, David Steele, unable to tighten the Reformed Presbytery of North America's restrictions on voluntary associations, withdrew in 1840 to found the Reformed Synod of North America. In 1844, most of the denomination united with the Associate Reformed Synod of the South. Other Steelite bodies persist, generally with one charismatic leader, including the Reformed Presbyterian Church (Covenanted), the Covenanted Reformed Presbyterian Church, and the Reformed Presbytery in North America (General Meeting). The Associate Reformed Presbyterian Church and the Associate Synod of North America united on May 26, 1858 at Seventh and Springfield Streets in Pittsburgh, forming the United Presbyterian Church of North America. The UPCNA merged with the Presbyterian Church in the U.S.A. in 1958, also in Pittsburgh. Welsh immigrants to upstate New York in the 1790s brought the Welsh Calvinistic Methodist Church with them. On May 10, 1828, four churches of Oneida County met in gymnava or assembly at Penycaeran. The growing denomination renamed itself the Calvinistic Methodist Church in the U.S.A. in 1869, and merged into the Presbyterian Church in the U.S.A. in 1920. The United Presbyterian Church of North America and the Presbyterian Church in the U.S.A. met jointly in General Assembly at Pittsburgh, Pa. in 1958, forming the United Presbyterian Church in the U.S.A. The Presbyterian Church in America left the PCUS in 1973 in protest of the denomination's liberalism. The denomination has over 1700 congregations and 350,000 members. The Evangelical Presbyterian Church left the UPCUSA in 1981, rejecting the liberalism of the Northern stream. As of 2012, it counts 140,000 members in 364 congregations. The General Assemblies of the United Presbyterian Church in the U.S.A. and the Presbyterian Church in the U.S. met in Atlanta in 1983 to reunite, forming the Presbyterian Church (U.S.A.). With nearly 2 million members in over 10,000 congregations, the PC(USA) remains among the largest American mainline protestant denominations. Objecting to the ratification of Amendment 10-A to the PC(USA) Book of Order, conservative Presbyterians met in Orlando, Fla. in January 2012 to form ECO: A Covenant Order of Evangelical Presbyterians. Korean Presbyterian Church in America, now the Korean Presbyterian Church Abroad (name changed in 2012) is an independent Presbyterian denomination in the United States. It was founded in 1976 as a union of 3 Korean language Presbyteries. The mother church was the Presbyterian Church in Korea (TongHap). According to the recent statistics it has 55,000 members and 302 congregations. The KAPC is a conservative denomination formed in 1978 by Korean immigrants in the campus of Westminster Seminary in Philadelphia, PA. The church has more than 53,000 baptized members and 600 affiliated congregations.